It's that crazy time of year when it just doesn't seem like there's enough hours in the day! I'm busy shopping, wrapping, decorating, and getting everything in order for Christmas and New Years. Come on 2017. 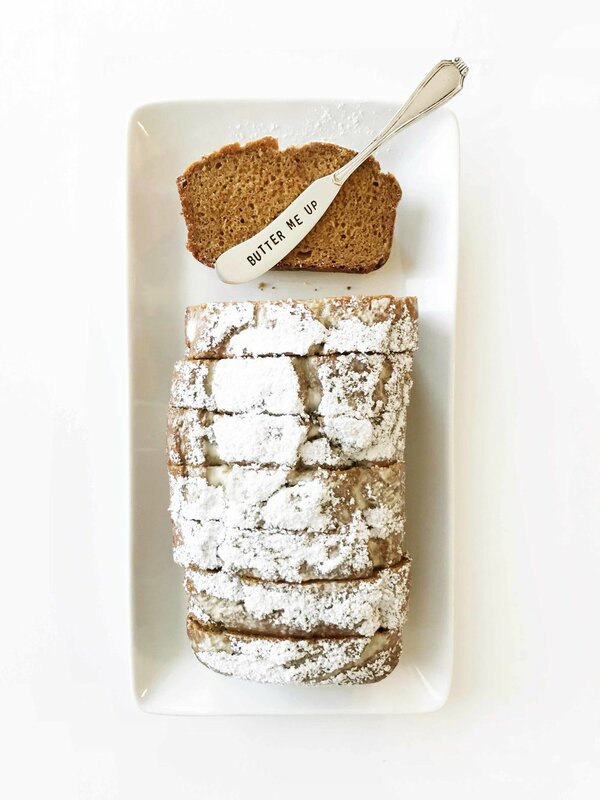 That being said, I woke up this morning and decided to get this Healthy Gingerbread Loaf whipped up and ready for the influx of company to enjoy. 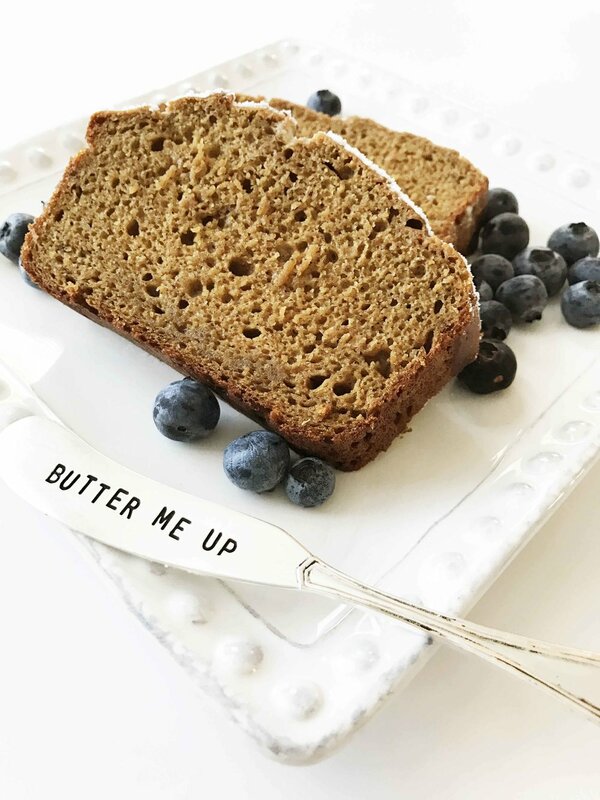 If you love pumpkin bread and you love gingerbread cookies, then you are going to adore this Healthy Gingerbread Loaf! It's got just enough gingery spice and sweetness to blend perfectly together. One of my favorite things about this bread is that it's great for a holiday breakfast, gifting, or just having around to snack on. Plus, you can make it a few days in advance! 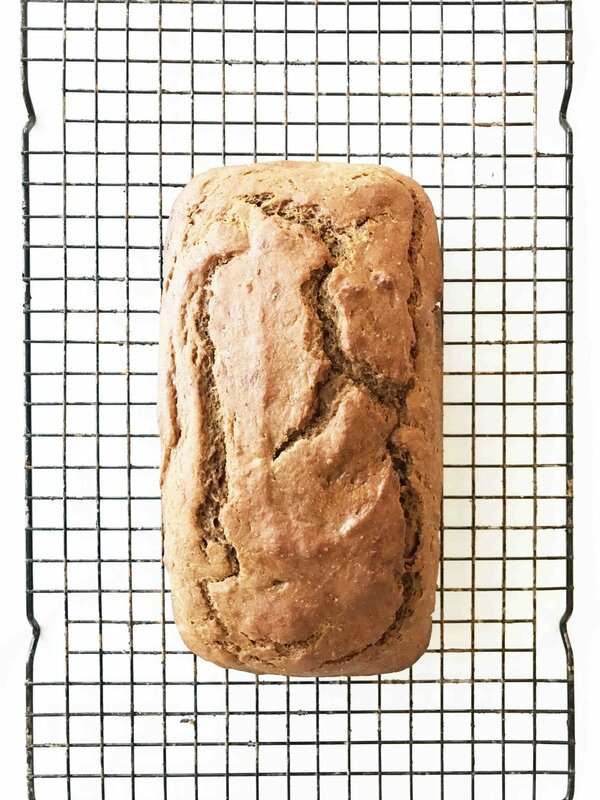 To lighten this loaf up I started out with my usual whole wheat white flour and loaded it up with all of the spices we know and love in gingerbread of any form. 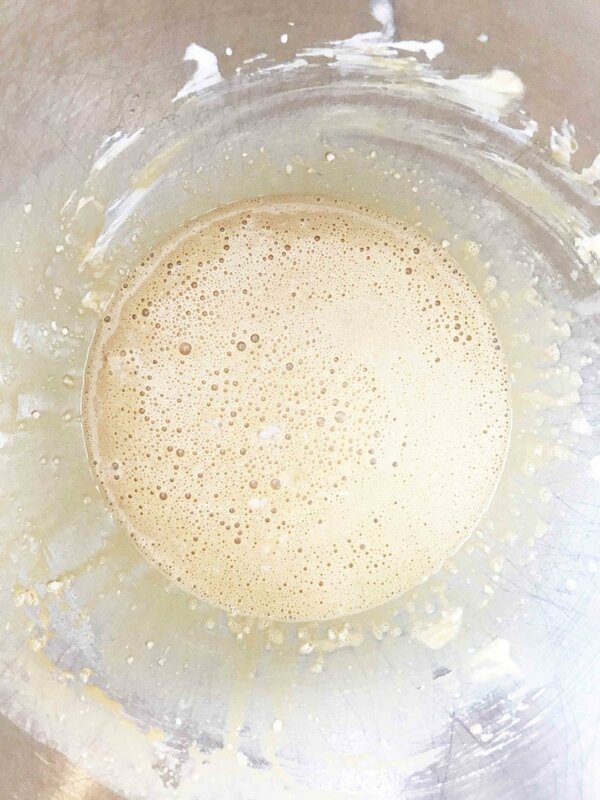 I then sweetened up the batter with a mix of maple syrup and vanilla. All of that was kept together with coconut oil and greek yogurt. The end result is a perfectly moist and ginger-licious loaf for all to enjoy. 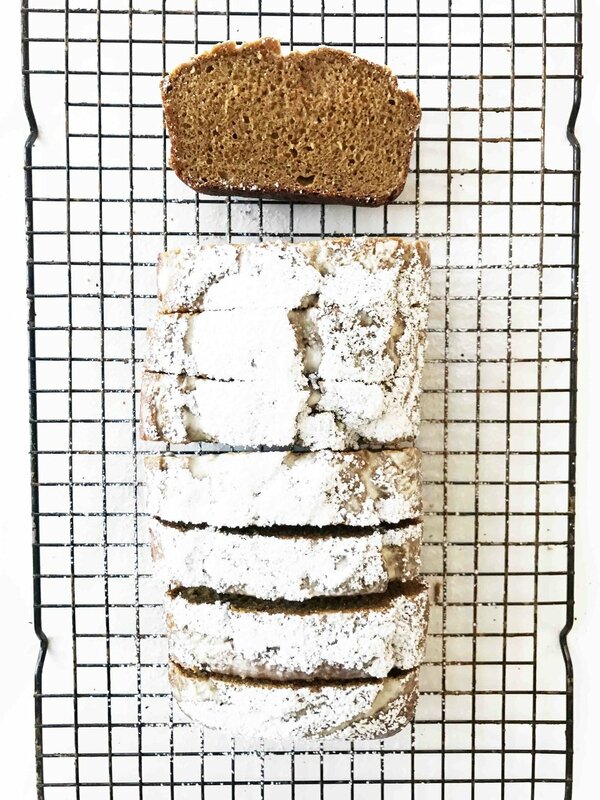 I sweetened my gingerbread loaf up further by giving it a nice dusting of powdered sugar. Mostly because my 6 year old has one of the most spice sensitive mouths on the planet. She'll tell you saltine crackers are spicy with a straight face. If it were up to me it would have been a much lighter dusting, I promise! Don't let the ingredient list fool you. This bread comes together really quickly and couldn't be more easy to toss together. Yum! 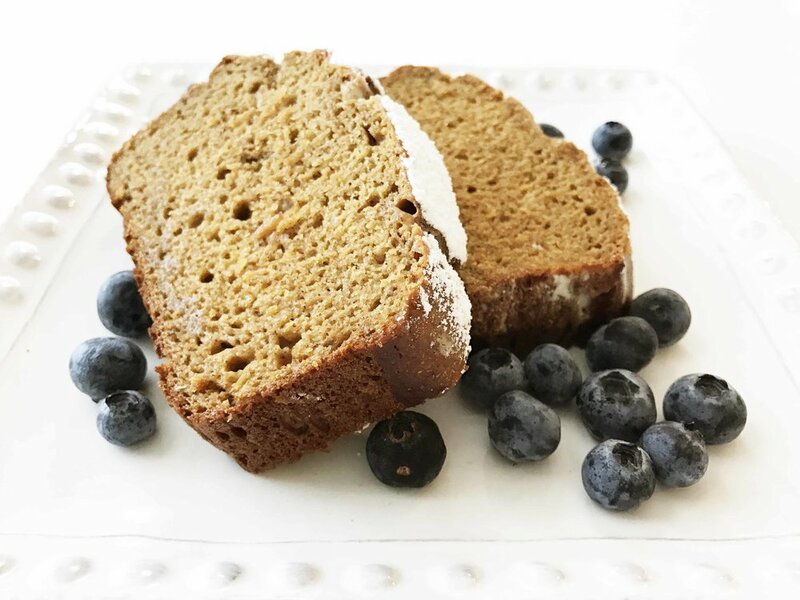 Give me all this Healthy Gingerbread Loaf instead of fruit cake! And for less than 200 calories in a nice hearty thick slice? Sign me up double time. I enjoyed m one served with plenty of fresh blueberries and some orange juice. But, I'm thinking a mimosa for Christmas day will be in order! Preheat the oven to 350 degrees F. and lightly coat the inside of a 9x5" loaf pan with non-stick spray; set aside. 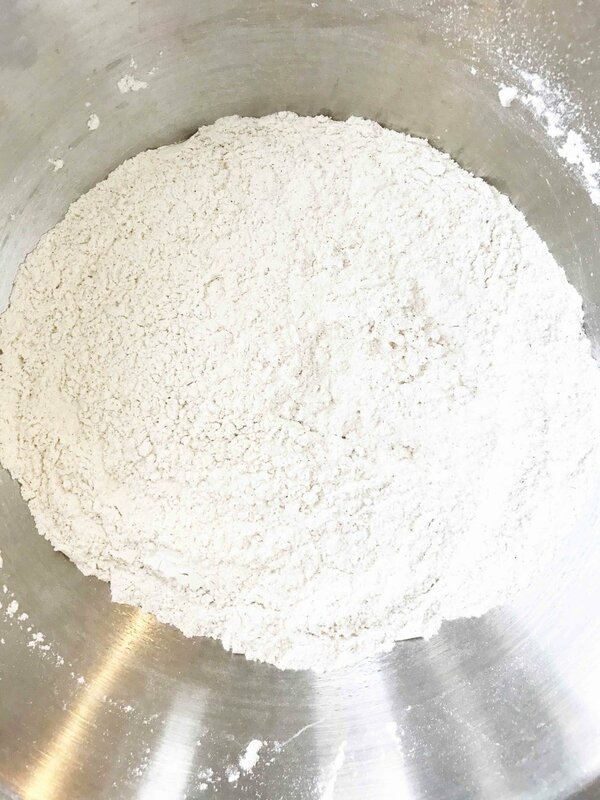 In a large mixing bowl whisk together the 2 C. White Whole Wheat Flour, 2 Tbsp. Ground Ginger, 1 Tsp. Baking Powder, 1/2 Tsp. Baking Soda, 1/2 Tsp. Ground Cinnamon, 1/4 Tsp. Ground Cloves, and 1/4 Tsp. Salt. In another large bowl, beat together the 3/4 C. Plain Fat Free Greek Yogurt, 6 Tbsp. Fat Free Milk, 2 Large Egg Whites, 1/4 C. Molasses,1/4 C. Sugar-Free Maple Syrup, 1 1/2 Tbsp. Vanilla Extract, and 1 Tbsp. Coconut Oil. Add the dry ingredients to the wet and stir until just combined. DO NOT OVER MIX. Pour/scoop the batter into the prepared loaf pan. Place the dish into the oven to bake for 45-50 minutes or until an inserted toothpick comes out clean. Once done, remove the pan from the oven and allow to cool slightly before transferring to a cooling rack to continue cooling. Once cool, dust with powdered sugar if desired and slice the loaf into 8 slices. Enjoy right away or store in an air-tight container for 3-5 days.